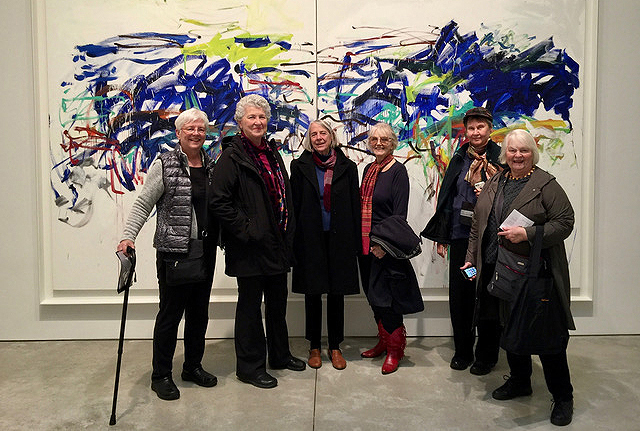 Guilford Art Center is pleased to announce The Friday Night Painters / Show Their Stuff, an exhibition of works by a feisty, dedicated, close-knit group of painters, some of whom have been working at GAC since the mid-1970s. The exhibition will be on view July 28-August 11, 2017, in the Mill Gallery at Guilford Art Center, 411 Church Street, Guilford, CT (I-95, exit 58). The opening reception is Friday, July 28, 5-7 pm, and a gallery talk, “The Story of the Friday Night Painters,” will be held Sunday, July 30, 2-4 pm. It will feature a brief history of the group, an informal Q&A exchange, readings by four Friday Night Painter (FNP) painter/writers (poems, essays, and short stories related to painting), and refreshments. Both events are free and open to the public. Individual members of the FNPs have been associated with GAC over the past 50 years – as students, teachers, board members, and show organizers. The bonds among the initial group were forged when they met during GAC classes in the 1970s. They are still meeting at the Center for their Friday night open-studio sessions, and with this exhibition they are saluting the Center on its 50th anniversary. The exhibition includes works in a wide range of styles and mediums by 21 FNPs, current and past: Lexi McCrady Axon, Bernie Braverman, Edward Casey, Catherine Ferguson, Virginia Foster, Shirley Gonzales, Timothee Graze, Gwen Gunn, Alice Hayden, Ed Horan, Ellen Lowe, Christina Maile, Molly McDonald, Julanne Meyers, Frank Modell, Parviz Mohassel, Scott Paterson, Diana Perron, Dan Rice, Rex Walden, and Marja Watson. FNPs at a NYC gallery for a show of Joan Mitchell’s work, 2016. FNPs critiquing work at a reunion at GAC, 2016. Dan Rice critiquing work in Maine, with Parviz Mohassel and Ed Casey, mid-1990s. In the mid-1970s, some members began taking painting and drawing classes at what was then the Guilford Handcraft Center with Dan Rice, the mentor and inspiration for the FNPs. Rice was a second-generation abstract expressionist painter who attended avant-garde Black Mountain College in the 1940s and 50s and later earned a master’s in architecture from MIT. Rice was an active member of the postwar New York art world – friends with Franz Kline, Mark Rothko, Willem de Kooning, Robert Rauschenberg, Jackson Pollack, Kenneth Noland, and Joan Mitchell, among others. The group had to disband when Rice moved back to New York City in the early 1980s, but they reassembled when Rice returned a few years later – living and working in a large studio overlooking a wide salt marsh in Madison. In the early 1990s, the original group persuaded Rice to begin hosting open-studio sessions on Friday nights, and the group grew to 14 painters. Some traveled each week from as far away as New York City and Long Island. These gatherings were never a formal “class” – instead, they were an informal, lively opportunity to paint and interact with others in the legendarily free and experimental tradition of Black Mountain College. Around this time, the group adopted the name “Friday Night Painters.” They held several exhibitions a year at Rice’s studio throughout the 1990s, sometimes attended by up to 200 people. A group of FNPs also traveled with Rice to the Maine Coast each summer, renting a house together for up to two weeks, and sketching, painting and critiquing each other’s work. 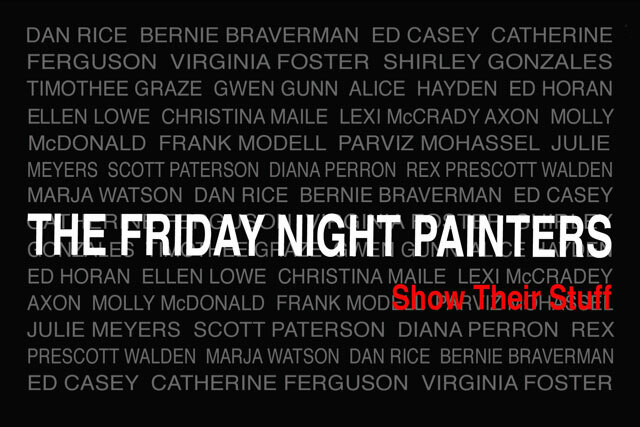 The opening reception for The Friday Night Painters / Show Their Stuff is Friday, July 28, 5-7 pm. A gallery talk will be held Sunday, July 30, 2 to 4 pm. Gallery hours are Monday through Saturday 10 am-4 pm and Sunday 12-4 pm. Admission to the gallery and both events is free.